The commercial push of insurance telematics is largely supported by usage-based insurance (UBI) as it can benefit insurers with more accurate segmentation of risk profiles and more efficient claims handling capabilities. While there are concerns about data privacy, customers have become more open to the idea of sharing their data with insurers in exchange for discounted premiums or additional services. UBI will change the face of personal auto insurance over the next five years, according to leading data analytics company GlobalData. An analysis of the company’s Disruptor Tech Database reveals that the proliferation of UBI is backed by three major data collection techniques which are on-board diagnostics (OBD), mobile only and hybrid solutions. The growth of smartphones enabling a better ease of use of connected devices through applications on the go is one of the key reasons for insurers’ interest in mobile. 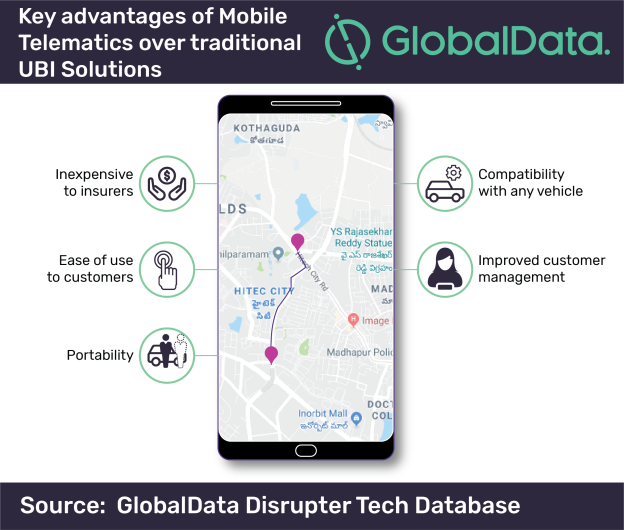 Telematics solutions through mobile still has its advantages though, it lowers costs for insurers as they rely on the consumer’s smartphone, eliminating the need to provide any additional hardware. They also facilitate portability, unlike OBD solutions where different drivers may be using the same car but only the car is tracked and not the driver. Another advantage is that they can be used with any type of vehicle. What is more, consumers are used to accessing apps on smartphones and hence could get engaged more frequently with insurers’ content such as training and advice that can enhance the user experience. Moreover, mobile telematics solutions generate a massive volume of sensitive personal and operational data that must be secured. Under the General Data Protection Regulation (GDPR), for instance, insurers, data processers and controllers will be held responsible for any data breaches. This reflects the need for insurers to be vigilant in choosing their telematics ecosystem partners. “Despite its barriers, adoption of mobile telematics would enable insurers to remain competitive in the face of agile digital predators. Their focus on quickly addressing the challenges can change the scene and bode well for customer acquisition, retention and management,” concludes Ben.